Vivid yellow, red, green and blue paint covers the cinder block wall of the Tuckaseegee Community Center in West Charlotte. 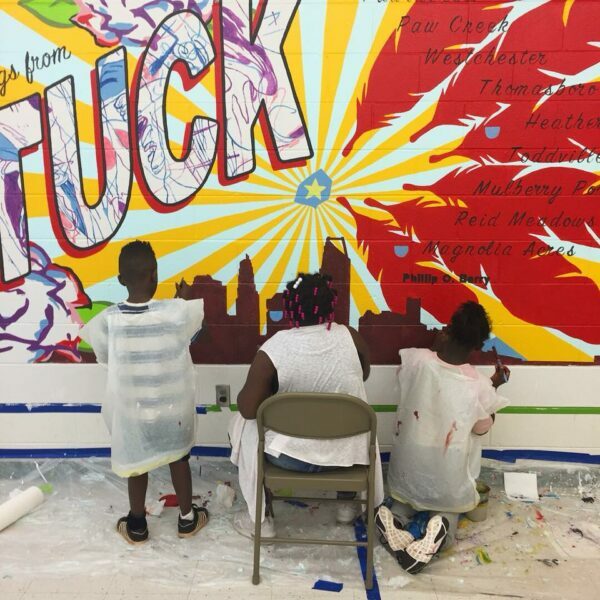 Young community members work with a muralist to transform a once plain wall into a vibrant colored postcard welcoming visitors into the community. Their art is part of the Arts & Science Council’s Culture Blocks program. Funded by Mecklenburg County, Culture Blocks brings arts, science and history experiences into neighborhoods – at libraries, parks, recreation centers, and other community spaces. 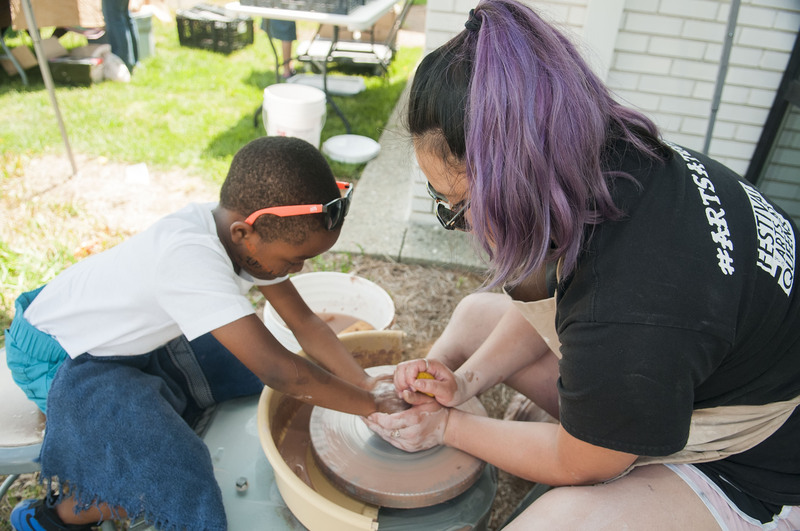 Culture Blocks embraces and celebrates the cultural life and desires of residents, connects communities to arts and cultural activities that speak to the community members’ interests, and seeks to break down barriers to participation with cultural organizations. Community members add their touches to a Tuckaseegee mural reflecting the Tuckaseegee neighborhood’s unique personality and characteristics. Since the initiative began, the Culture Blocks team has received positive feedback from the community members. Yet, the team wants to know more and have the ability to better measure and understand the results. This desire to better understand the impact of Culture Blocks led Whisman to reach out to Tom Barth, director of the UNC Charlotte Master of Public Administration (MPA) Program. As a 2013 graduate of UNC Charlotte’s Public Policy Ph.D. Program, she was aware of the MPA capstone seminar class, and she knew the students could perform a valuable service by assessing the Culture Blocks program as their spring project. Barth welcomed the call, realizing that the research project could provide the students the opportunity to gain real-world insights and have a positive influence on people’s lives. Throughout the capstone process, students are guided by MPA faculty members – Barth and Douglas Bean this spring – and an experienced local community consultant. The scholars conduct research to determine the impact of the designated program at the individual and community level. Past capstone projects with governments and nonprofits in the Charlotte region have focused on land development services, fire station location analysis, community service grants evaluation, review of one-stop permit processes, economic development assessments, recreation facility feasibility studies, and other research projects. What are the long-term outcomes that Culture Blocks organizers and their partners should expect? What is the experience of the providers of arts and culture programming? What are the outcomes for the organizations that provide sites for the programming? What can the literature – reports, academic studies and other materials – tell the ASC about what is working or is not working elsewhere? Can the academic literature provide insights into what activities are the most effective in accomplishing certain goals? The information the capstone project yields could help the ASC and Mecklenburg County determine next steps for Culture Blocks. This approach echoes the data-driven focus that led to the creation of the Culture Blocks program. 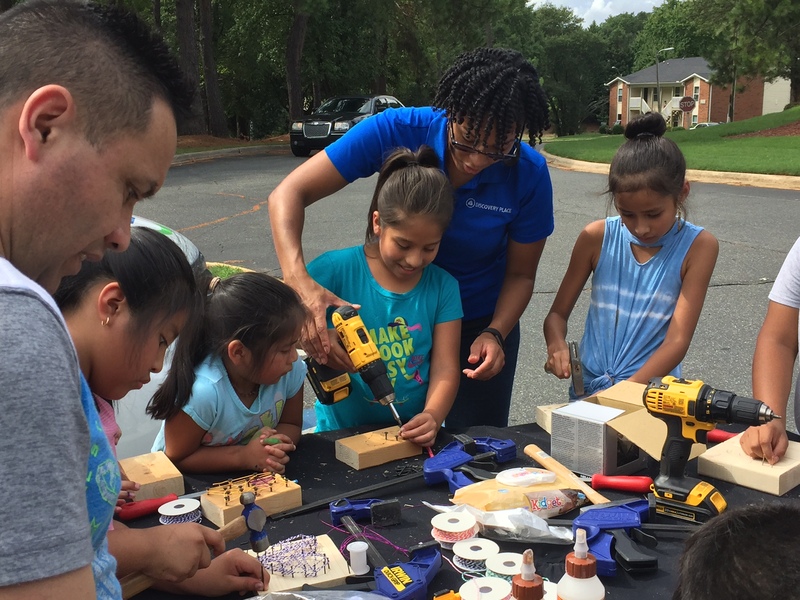 Discovery Place staff work with community members at Arborgate Apartments, using wood and random materials in a “Community Stories – Connected Future” activity. A Cultural Vision Plan issued by a Mecklenburg County Cultural Life Task Force in 2014 described changes the ASC could make to enable equity and broader access to the arts and cultural offerings. During this process, data was collected that assessed the location of people and the connectivity that people had with the cultural organizations that the ASC was funding. This finding concerned the ASC leadership. A high concentration of the arts in a community leads to higher civic engagement, more social cohesion, higher child welfare, and lower poverty rates, according to research by the Americans for the Arts, a national nonprofit organization focused on advancing the arts and arts education. When developing programming priorities, Culture Blocks staff meet with residents and community leaders to learn more about a community’s needs and its assets, such as artists and facilities. Those conversations take place at neighborhood meetings and community events and in one-on-one meetings. They incorporate community feedback into the program. The report by the UNC Charlotte students will provide additional data to help guide the ASC staff as they continue to work with community representatives and cultural program providers to identify partnerships, priorities, and resources to address participation barriers impacting area residents. “We really believe that culture builds bridges between people and communities, and that’s part of the foundation we’ve been working on,” Whisman says. Top image: A Clayworks workshop at Hickory Grove Library offers an opportunity for hands-on art activities.